Lucas Button who will be playing Pinocchio in The Dukes production which runs from November 25-January 7. Picture by Darren Andrews. 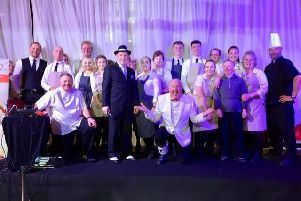 Eleven years after playing a tiny role in a Dukes Christmas production, Lucas Button has returned to the Lancaster theatre as star of the show. Now a graduate of London’s Royal Central School of Speech and Drama, Lucas will be playing Pinocchio in The Dukes’ festive production which runs from November 25-January 7. And just two weeks after Pinocchio ends, Lucas will be rehearsing with the English National Opera for their production of The Winter’s Tale at the London Coliseum where he will be directed by the Olivier Award winning actor, Rory Kinnear. So life’s quite a busy stage for the 21-year-old former pupil of Quernmore Primary School and Queen Elizabeth School, Kirkby Lonsdale. Back in 2005, Lucas was one of three boys taking it in turns to play Tiny Tim in A Christmas Carol, after his dad, Peter Button, a Dukes Box Office assistant and duty manager, suggested he audition. “I remember wanting to do every performance and I knew then that I wanted to be an actor,” Lucas said. Recently he has formed a new theatre company, Mad Like Roar, with friends but for now, Lucas is concentrating on ensuring his Pinocchio will keep families entertained and he is looking forward to spending more time with his Lancaster-based family over the festive season too. To book tickets for Pinocchio, ring The Dukes box office on 01524 598500 or visit www.dukes-lancaster.org.